A native of Sunset Park returns to find his old home gone and the neighborhood transformed. I grew up on Eighth Avenue in Sunset Park, a stretch of commercial and residential properties in the heart of Brooklyn that forms the backbone of the borough’s Chinatown. My roots in the neighborhood stretch back to the late 1940s, when my maternal grandparents — after leaving the poverty of rural China in search of economic opportunity — settled at 5213 Eighth Avenue, between 52nd and 53rd streets. Although it looms large in my memory, my grandparents’ home was actually quite modest: a three-story walk-up, which was typical of other buildings on the avenue, with an alleyway, a green awning, and a black fence. On the first floor of this building was Tom Wah Laundry, a small business my grandparents ran for over 30 years. To make ends meet, my grandfather waited tables at a Chinese restaurant, King Ho (long since closed), in Midwood, while my grandmother managed the laundry and took care of their seven children. I have three aunts and three uncles on this side of the family; my mother, who was born in 1960, is the youngest of the bunch. Decades later, my grandmother (whom we called “Paw Paw,” Cantonese for one’s maternal grandma) raised my younger brother and me on the ground floor of this house, as our own parents worked during the day. My grandparents always claimed they were the first Chinese immigrants in Sunset Park. Even if the family legend isn’t entirely accurate, they were certainly some of the first to arrive. Until the early 1980s, Sunset Park was predominantly home to Norwegian and Italian immigrant families, who found employment in the factories and shipyards along the nearby waterfront. But as immigration patterns and the city’s economic landscape changed, so too did the demographic makeup of the area. At left, Tom Wah Laundry and the family home at 5213 Eighth Avenue in 1972. At right, the building in the 1960s. 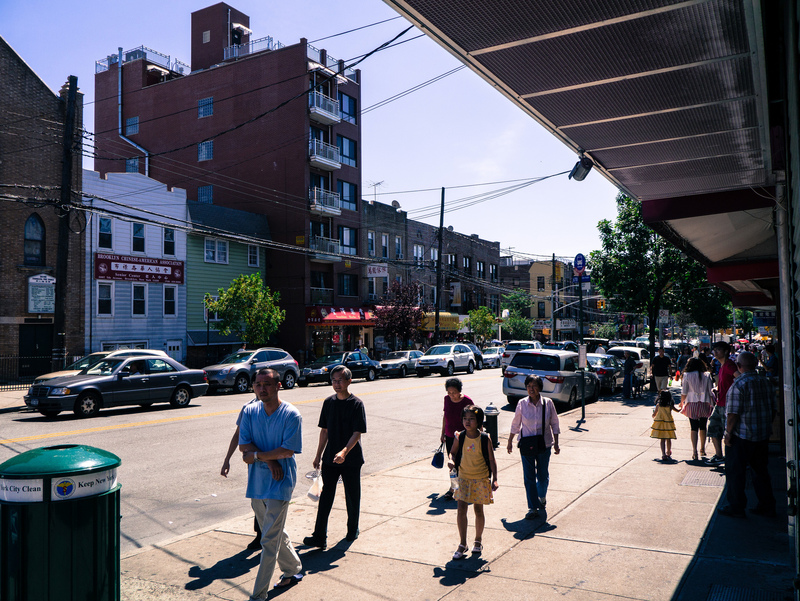 With areas like Greenpoint, Williamsburg, and even parts of Manhattan’s Chinatown rapidly becoming too expensive for low- and middle-income earners, Sunset Park has remained an attractive place for recent immigrants to settle. Sunset Park is not a neighborhood of warehouses or raw lofts; it does not seem poised to become the next hip locale. Yet the future of Sunset Park as a starting point for immigrants — the neighborhood where my grandparents established Tom Wah Laundry and built a life for our family — now hangs in the balance. With high-rise condominiums popping up and new zoning regulations allowing for larger commercial expansion, the face of Eighth Avenue and the greater Sunset Park area is changing radically — perhaps irrevocably. A stroll down Sunset Park’s iconic side streets reveals rows of historic townhouses, built in the early 1900s as homes for those who worked on the Brooklyn waterfront. Most blocks in the neighborhood consist of two- to four-story houses and apartment buildings, with some apartment buildings rising to five or six stories. But occasionally the casual observer will encounter buildings even taller than that. Prior to 2009, zoning rules had allowed developers to construct buildings that were much larger than the low-rise row houses for which Sunset Park is known. The towering buildings produced by this zoning scheme strained the community’s infrastructure, including its sewage, sanitation, and electricity systems, which were designed for a neighborhood of row houses. The new developments, which tend to attract young professionals, have also contributed to rising rents in the neighborhood, as landlords see the potential to make a profit off wealthier outsiders. According to Michael Schweinsberg, a representative for City Councilwoman Sara M. González — whose district includes Sunset Park — community concerns about development came to a head in 2007, when developers announced a plan to construct a twelve-story condominium on 42nd Street between Fourth and Fifth avenues. The prospect of an enormous condo tower looming over Sunset Park — the historic 25-acre park for which the neighborhood is named — galvanized local residents to speak up against out-of-context development in the area. 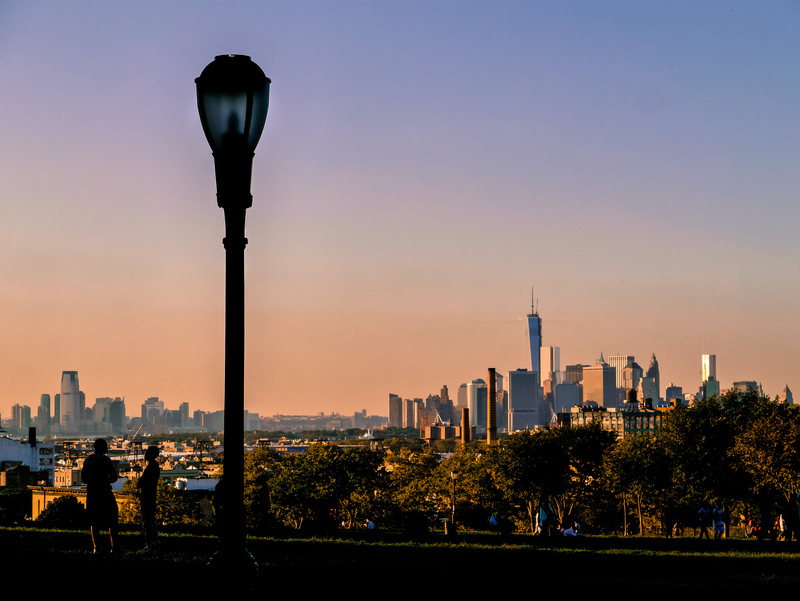 The Manhattan skyline, viewed from Sunset Park. This victory showed members of the community that their voices could influence local development, sparking a “Rezoning Now” movement, which eventually led to the 2009 rezoning, Schweinsberg said. “Finally the community woke up about how development would affect their neighborhood and themselves,” he said. In April 2009, at the request of residents, local elected officials, and the community board, the Department of City Planning certified a 128-square-block rezoning of Sunset Park. The City Council approved the plan in late September. According to a report published online by the department, the rezoning had three major goals: to preserve neighborhood character and scale by replacing the old R6 district with contextual zoning and height limits; to create opportunities and incentives for affordable housing through an inclusionary housing bonus (which would allow for additional floor space in new developments in exchange for the creation or preservation of affordable housing, on- or off-site); and to adjust the boundaries of commercial districts to reflect existing development patterns while preventing encroachment by businesses onto residential side streets. The major streets affected by the rezoning were Fourth, Fifth, and Seventh avenues, which were downzoned to prohibit buildings higher than 80 feet. Six full blocks along Fifth Avenue between 50th and 56th streets kept their old zoning designation, which allows for commercial uses above the ground floor in buildings with residences, as well as larger retail establishments such as department stores. A survey conducted by the Department of City Planning at the time found that the rezoning was expected to result in a net increase of 75 total residential units, up to 64 of which would qualify as “affordable housing,” and a net decrease of 17,454 square feet of non-residential (that is, commercial) space. These numbers were compared to a future without rezoning, and the department concluded that there would be minimal environmental impact from the changes. 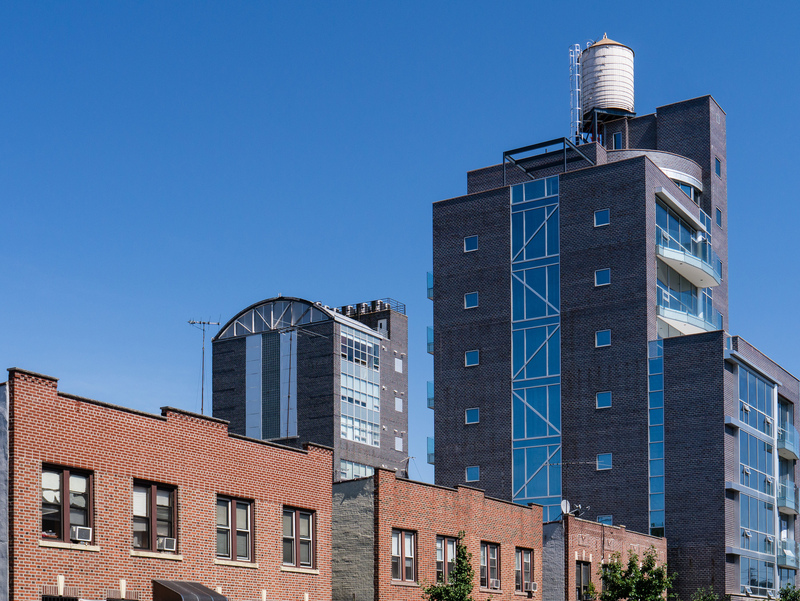 Schweinsberg said the 2009 rezoning was largely successful due to the series of public debates that went into the project, but added that the amount of affordable housing Sunset Park gained from the rezoning fell short of expectations. The Eighth Avenue of my childhood was full of small buildings, typically three stories in height, with commercial businesses on their first floors and residential units above. In recent years, those who live or work along Eighth Avenue have witnessed the construction of shiny new condos, as well as commercial expansion onto residential side streets. Yet the avenue, which falls within two different community districts, was conspicuously left out of the 2009 rezoning. At the time the rezoning was being debated, Community Board 7 (whose district contains the western side of Eighth Avenue) and Community Board 12 (whose district contains the avenue’s eastern side) could not agree upon how to amend Eighth Avenue’s predominantly commercial zoning. The avenue was ultimately left out of the 2009 rezoning, to avoid delaying the rest of the project. If some proponents of limited growth were frustrated by Eighth Avenue’s exclusion from the rezoning, others felt the plan had sold out Sunset Park’s long-time residents. In August 2009, while the plan was being considered in the City Council, the Chinese Staff and Workers’ Association, a nonprofit workers’ rights organization focused on the restaurant, garment, and construction industries, filed a lawsuit against the city, seeking to block the plan. 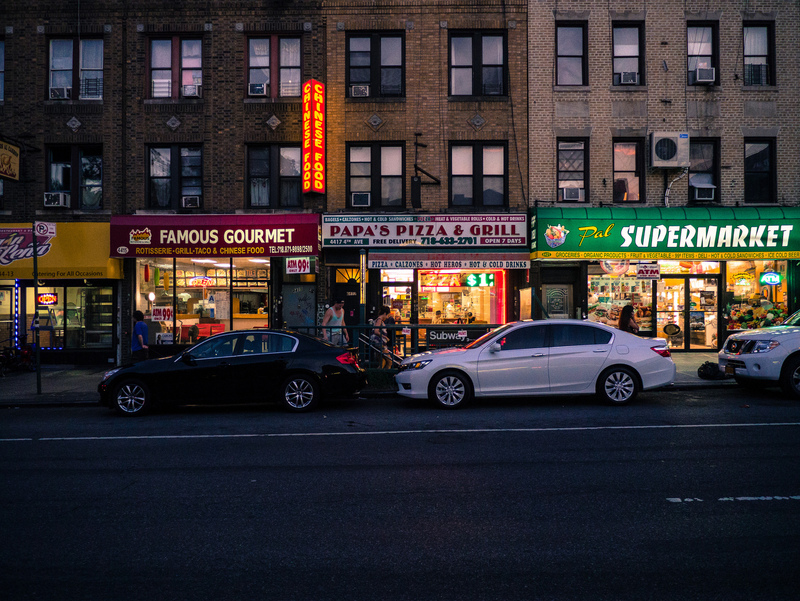 The suit alleged the rezoning plan would encourage more luxury development and large chain stores in Sunset Park, leading to the displacement of residents and small commercial businesses operated by the neighborhood’s low-income Asian and Latino communities. The court ruling removed the final obstacle to the rezoning of Sunset Park, opening a new chapter in the neighborhood’s history. The fight over the rezoning plan stemmed, at base, from concerns that Sunset Park would become the latest addition to the ever-expanding list of gentrifying neighborhoods in Brooklyn. Four years later, as immigrants from China, Mexico, and other countries … as well as wealthier professionals … continue to filter into Sunset Park, affordable housing in the neighborhood is becoming even more of an acute concern. An agent from LCCW Realty, a real estate agency on 56th Street and Eighth Avenue, told me the average rental price for a two-bedroom condo in Sunset Park is $2,000 per month, not including electricity, gas, utilities, or the broker’s fee. She said the cost to buy such a unit at a 15-year mortgage rate would come out to $330,000, adding that her company does not have any one-bedroom condo units available at this time due to high demand. By contrast, brownstones in Sunset Park sold for $20,000 to $30,000 in the early 1970s, rising to $50,000 by the end of that decade, and reaching around $150,000 in the mid-1980s. Monthly rent for single-floor apartments in brownstones during the same era could have been anywhere from $450 to $600, not including utilities. A new development rises over older buildings on 60th Street off Eighth Avenue. Jimmy Li, the family service coordinator at the Chinese-American Planning Council, a nonprofit organization which provides educational, social, and community services for Chinese-Americans across the city, has been a resident of Sunset Park for seventeen years. He said he has seen a huge jump in the price of rent over his time in the neighborhood, with even one-bedroom units now renting for thousands of dollars per month. Li also said the elderly face a particularly hard time finding affordable housing in Sunset Park. Many elderly people in the neighborhood have been applying for low-income housing through the New York City Housing Authority for years, he said, but have met little success. The severity of the housing shortage in Sunset Park may be even worse than it appears because it’s hard to be precise about population figures in the neighborhood. Immigrant communities — where people may not speak English or be familiar with American civic traditions — were likely undercounted in the 2010 census. (“It just doesn't make any sense at all,” Mayor Bloomberg said of the census results at the time. “When three boroughs go up dramatically, and the two most populous boroughs don’t, something's wrong.”) The uncounted would include immigrants who are undocumented or are living in illegally subdivided homes, Laufer explained. Those who live in the neighborhood have certainly felt the change. Edna Gonzalez, who has lived on Eighth Avenue with her sister, Lydia, and her mother, Francesca Gonzalez-Carrion, for 30 years, said Sunset Park has changed “drastically” since her family arrived in the 1980s. Gonzalez said she finds the neighborhood more crowded than it used to be, adding that houses which were formerly one-family homes now contain businesses and multiple families. Anita Tonnesen, the daughter of Scandinavian immigrants, has lived on Eighth Avenue for 47 years. Tonnesen said she was able to speak Norwegian in most stores on the avenue when she was younger. She is the last of her childhood friends to remain in Sunset Park. The idea behind the 2009 rezoning was to strike a balance between preserving Sunset Park’s historic neighborhood character while also creating opportunities for affordable housing. To accomplish the former, the city employed “contextual zoning,” which regulates the height and bulk buildings along street fronts, ensuring they fit in with their surroundings. The affordable housing component of the plan made use of the Inclusionary Housing Program, which offers developers an optional floor area bonus in exchange for the creation or preservation of housing units, on- or -off-site, for low-income households. Developers who agree to create opportunities for affordable housing under the IHP get more space to build. The affordable units created through the IHP must permanently remain affordable. But critics of the inclusionary program argue it can actually reduce affordable housing in communities and accelerate gentrification. Developers seeking to take advantage of the program demolish older, cheaper buildings, replacing them with luxury apartments. Some affordable units are constructed, but the end result is a net decrease in reasonably priced housing, leaving many residents left out of luck. Housing experts like Bomee Jung, who serves as deputy director of Enterprise Community Partners — a nonprofit organization focused on affordable housing development and preservation — have questioned the use of the IHP in Sunset Park, and to what extent the program has helped low-income residents find homes. According to Jung, the Inclusionary Housing Program works best as an incentive when there is high demand for housing in an area of low development potential, coupled with capital subsidies that relieve rent-burdened households. Sunset Park doesn’t really fit that profile; meanwhile, the economic recession has shrunk the pool of funds available for subsidies. Li said he believes housing prices will continue to increase in Sunset Park so long as there are opportunities for unregulated development in the neighborhood. He added that he hopes there will be public funding for affordable housing at the local, state, or federal level (with special consideration given to seniors) and pointed to the Confucius Plaza Apartments in Manhattan’s Chinatown — a limited-equity housing cooperative, which was the first major publicly funded housing project built primarily for Chinese Americans — as a good model. At 44-stories, the Confucius Plaza complex contains 762 apartments and cost $38 million to build in 1975. Li said the number of apartments available on and around Eighth Avenue needs to grow in order to accommodate the neighborhood’s rapidly expanding immigrant population. In the long term, that will necessitate government assistance, he said. Get Well Pharmacy has been a fixture on Eighth Avenue for nearly 20 years. When my grandmother began requiring medication for her diabetes, my family filled the prescriptions at Get Well, which was just across the street from her old house. 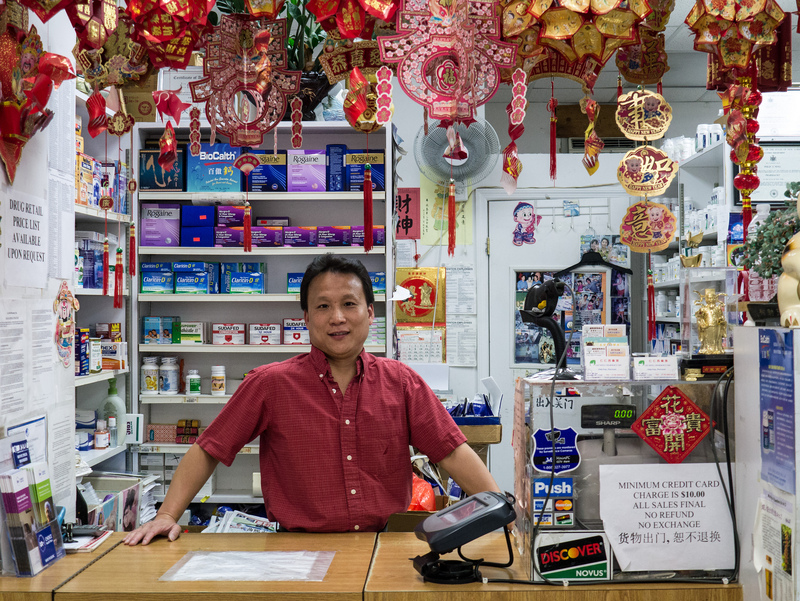 Philip Peng, the pharmacy’s owner, has watched the neighborhood outside his shop window change, especially over the past decade. Some merchants have pushed to lift the restriction on second-story businesses, which are permitted on many of the neighborhood’s other commercial thoroughfares. Meanwhile, residents are concerned about commercial encroachment because businesses like ever-popular Internet cafés can contribute to noise pollution and take away parking spaces at all hours of the day. Phillip Peng owns Get Well Pharmacy on Eighth Avenue. Laufer said he would like to see the Department of City Planning reduce commercial overlays on the avenue’s side streets to 75 or 100 feet. (He suggested that older buildings be grandfathered in to the new rules.) Along with his proposal to set a maximum height of 70 feet for buildings on Eighth Avenue, this change would preserve the residential character of the neighborhood, while allowing “limited and balanced” growth, he said. But in order for any sort of rezoning project to go forward, the community boards and various city agencies would need to agree on its terms. Typically, the community boards set parameters for a rezoning plan based on the input of residents and business owners. City Planning conducts its own survey and presents its own version of the plan back to the community boards or the community at large. The process can take months, or even years. Schweinsberg said the community around Eighth Avenue hasn’t been galvanized because no single development — such as the one on 42nd Street near Sunset Park — has caused a stir among residents. Both Laufer and Sender said their community boards met last year to discuss potential changes to Eighth Avenue’s current zoning, but they did not settle on an official plan. Meanwhile, and the Department of City Planning has been focused on other areas of Brooklyn in the past four years. Michael Shilstone, a press officer for the department, said it had several conversations with both community boards after the 2009 rezoning of Sunset Park, at which time there was no consensus towards “a specific rezoning strategy.” He added that City Planning was not aware of a change in that status. “We remain open to discussions with the community about appropriate solutions that provide additional opportunity for economic and residential growth while protecting neighborhood character,” Shilstone wrote in an email. While these various city agencies may not agree about what the next steps should be for Eighth Avenue, residents, business owners, and social workers I spoke with said they would like to see a greater accommodation of the neighborhood’s burgeoning immigrant population through more affordable housing, legalized second-story businesses, and increased sanitation services in the neighborhood. As the city gears up for a new mayor next year, the people of Sunset Park are hoping for action. In 2000, when I was seven, my parents moved from Sunset Park to Belle Harbor, Queens. Although our family’s laundry business on Eighth Avenue had long since closed, my grandmother remained in the neighborhood until she could no longer take care of herself. For a time, she lived on the first floor of the house, once occupied by the laundry, and rented the top two floors to help pay for her living expenses. Then, six years ago, with my grandmother reaching old age, we decided to sell the house. If you visit my old block today, you’ll still see the Methodist church on the corner of 52nd Street. As a child, I would walk by this church with my grandmother, dragging my index finger through the spaces between the bars of the church’s gate. (“One, two, three…”). At the corner of 53rd are the remains of a recently closed Chinese bakery; a neon orange sign announcing the arrival of “Kings Kitchen” hangs above the dust-stained doors. Across the street is a mix of local businesses on the first floors of walk-ups: Get Well Pharmacy, 168 Friend’s Garden, Lucky Dragon Bakery, Graceful Furniture. Like my grandmother’s old kitchen, one of the great things about Eighth Avenue is the wide availability of delicious food it offers. But our old house at 5213 Eighth Avenue is gone, replaced by a narrow, six-story condominium made of brick and steel. On the first floor, where the laundry used to be, there’s now a Chinese medicine store, Sunshine Herbs Corp.
Eighth Avenue between 52nd and 53rd streets. The brick tower at center stands at 5213 Eighth Avenue. My grandmother is also gone — she passed away three years ago, at 83, after a protracted battle with pancreatic cancer. The Sunset Park I once knew — the Sunset Park she knew — is changing at a rate never before seen in the neighborhood's history. Condominiums are rising higher and higher, as are rents, pushing lower-income residents farther and farther away. My grandparents, like so many immigrants before and after them, dreamed of building a better life in Sunset Park. But today, those dreams are in danger of being priced out. Andrew Giambrone is a senior at Yale University and a former staff reporter for the Yale Daily News. He grew up in Sunset Park.